wayneandwax.com » Are These the Breaks? Now, undoubtedly the Amen break is one of the most heavily sampled recordings since the advent of digital sampling, but I wouldn’t know how to begin assessing, quantitatively, whether it is indeed the “most sampled” break of all. (Let’s put questions of “foundation” aside for now, never mind what it means to sample a “rhythm.”) I’d like to take the opportunity, then, to raise some methodological questions, not to mention musical-ethical-technological questions, about the class of samples that have far outstripped their breakbeat brethren in terms of frequency and prominence. Such “breaks” — tho they’re not always breaks in songs, per se; some are full or partial instrumentals — essentially become basic building blocks, linked less to their initial recordings (for listeners and producers) than to the dozens or hundreds of other tracks that have also sampled them, hence accruing a kind of associational-emotional resonance deeply entwined with notions of genre and style. Though he discusses its ubiquity (and submits that it has now passed into what he calls the “collective audio unconscious”), Nate Harrison never makes as bold an assertion in his video. Which is not surprising. The actual numbers are awfully hard to get at, quite elusive in their vast undocumentedness (and perhaps undocumentability, as I’ll discuss below). In the pantheon of well-worn breaks, the Amen certainly scores high — probably top three (as an “off the top” estimate), but who can say conclusively? I make my own estimate based on years and years of listening to hip-hop, jungle, and various other sample-based (and break-centric) genres — and, natch, absorbing other people’s opinions on the subject. But this remains, ultimately, an intuitive sense of things. Getting at the stats isn’t any easier, and pursuing them is itself often an ambivalent activity. There is the-breaks.com of course, which, however, tends only to list hip-hop tracks that employ samples (and, in the case of the Amen, only 32 out of what is surely a far greater number). As a hobbyhorse and a relatively small-scale, user-supported endeavor (without the critical mass of a project such as Wikipedia), the-breaks is doomed to incompleteness, and certainly slowness. And with a break like the Amen, which has likely supported far more jungle/d’n’b tracks than hip-hop beats, a site like the breaks is likely to be a poor barometer for overall trends (esp given the proliferation of sample-based tools and styles). Practical and ethical issues aside, let’s return to the main question for the sake of speculation: is the Amen the “most sampled” “break”? As I mentioned above, my intuitive sense is that the Amen break has indeed been employed a staggering number of times — quite disproportionate in relation to most of its breakbeat kin. Even so, I can’t confidently say whether it is or is not the “most sampled” break. And part of my hesitancy here is that I’m aware that there are several other recordings, similarly seminal we might say (blame the patriarchy), which I suspect might vie with the Amen at the top of the heap. Although I think it’s a stretch to say that the Amen was “foundational” for any genre (e.g., jungle was both emergent and breaky before it adopted the Amen as drumkit, while the Apache, et al., have rolled alongside it all the while), I’d agree that it’s quite difficult to imagine jungle and d’n’b without it. I realize I’ve gone on at some length here without really addressing the crucial question of whether (and why) it matters that one break might have been sampled more than others. That’s too big a can of worms to open at this point, so allow me to close by offering some possible areas of inquiry with the contention that it’s not only important to think about such issues alongside the more straightforward ones about assembling and making sense of data, it’s far more important. Qualitative studies can no doubt be informed and supported by accurate, robust, analyzable data (yo Pace, where you at? ), but quantitative methods don’t get us very close, I don’t think, to such issues as, if I may submit a few: pliability of forms, creativity against constraints, public domain activism, supremacy of analog technologies (and/or digital ! ), the idiosyncratic sound of the band (esp the drums), the inspired performance of the Winston’s drummer, Gregory Coleman (whose recent passing seems conspicuously unregistered among the denizens of the breaks), the resonance of well-worn, remixed recordings in the age of digital reproduction, the aesthetic implications and cultural politics of such practice, and on and on and on and. Excellent post. It’s so nice to see someone adding some complexity to this discussion. When I saw the announcement of Nate Harrison’s documentaries, I was both excited and nervous. Why do we need to confer “foundational” status on any sample or break? Automatically, this privileges the genre(s) where the sample/break in question is most ubiquitous. I would argue that one of the biggest problems with forging a history of a meta-genre like sample-based musics is that automatically certain narratives must be left out for no other reason than ease. There are simply too many stories to consider in the last 25-plus years of popular music making. Once you depart from the Billboard charts, there is no mainstream story, and the historian/critic must make choices (ethical to the core) that could have devastating effects if she is acting alone or in a small group. Take, for example, the narrative of EDM codified by Simon Reynolds and the contributors to Peter Shapiro’s Modulations. We don’t see much of a discussion of mainstream popular dance music from the same period (Euro-dance, Club MTV, and Italo-disco, to name a few). Suddenly jungle, hard-core and non-booty hip-hop are where it’s at. Anything that doesn’t have arty posturing, or the potential for deleuzian post-modern readings, is too difficult to fit in. Kind of eerie if you ask me. It’s worth noting that Modulations has sidebars on bass and freestyle and synth-pop, but, yeah, they’re only sidebars. Limited space creates some hard choices, but we definitely need to think hard about where we draw the lines. On a related note, lots of Caribbean and other putatively “world” music — often crucially if not entirely electronic in constitution — also gets left out of various electronic music narratives. Matters of taste do come into play quite heavily, so “uncool” — indeed, “hot hot hot” — music such as soca and merengue don’t hardly get a nod. 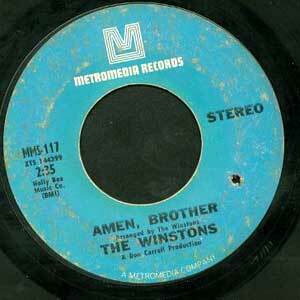 I went on quite an “amen” frenzy after we heard dj miles play the winstons’ track at star shoes that night after then conference. my first impression was a strong urge to play it over and over, rewinding 15 seconds and listening again and again. Dave Eggers writes about repeatedly listening to songs until he figures out their *secret*. Even if its not the most sampled ever, I think its fair say that the Amen break is the most addictive, somehow remaining elusive and mysterious despite its simplicity and ubiquity. What do you know about the copyright history of the song? Wiki says “Neither the drummer, Gregory C. Coleman, nor the copyright owner Richard L. Spencer, the Grammy-award winning composer and performer of the hit “Color Him Father”, has ever received any royalties for the sampling.” Has someone else (a record company, presumably) been collecting royalties or has this songs penetration into the â€œcollective audio unconsciousâ€ somehow located into the public domain? Can anyone sample this track without fear of being sued? I had dream with time elaspsed audio, but it wasn’t high pitched chipmunks (which would logically make the most sense) but some slowed and throwed / chopped and screwed ish. great post, best ive read. blog on. According to Nate Harrison in his documentary (which you should definitely peep if you haven’t yet), the Winstons remained copyright holders and have never sued anyone over the use of the break (to date). That’s pretty amazing, I’ll admit, though the way sample litigation was going for a while (which is to say, chillingly, but not exactly unreasonable in its reach), the copyright owner might have had a hard time proving — esp given the prejudice against drum breaks/beats (i.e., non-pitch elements, or “purely” rhythmic passages) as something for which one could reserve a publishing right (but not a mechanical right, which was always granted) — that a loop of the break (a la NWA or Mantronix) constitutes an infringing use, never mind the sort of radical (if recognizable) re-assemblages for which jungle is known. The “three notes” case changed that, though, at least for the time being (and for the US, of course), ruling than an unauthorized sample of any length was an illegal use. Harrison argues in the doc that the Amen break has passed into a kind of public domain status as a result, which I would agree with. (He also points out some pretty shady practices whereby breaks-records cats have redistributed it under their own copyright, which is bogus.) Of course, if “people” like Bridgeport ever get their hands on it, watch out, but for now, I think it’s pretty safe to chop and paste. Thanks for the link, Droid. Sounds like an interesting, promising project. Great to hear that the original engineer is still around and forthcoming. I’m sure it’ll blow his mind to learn about the long life of that break. Great article. How about “Under me sleng teng” the Casio MT40 riddim which launched a thousand (well 380 according to wikipedia) tracks? Good point, Paul! Reggae’s riddim system definitely offers another great set of examples of well-worn riffs and rhythms. The reason I don’t include them here is that, for the most part, the subsequent versions and re-uses of popular riddims like Sleng Teng are not based on samples but are “re-licked” by studio musicians. Now, as it happens, Sleng Teng is a bit of an exception in this regard since it’s very distinctive MT40 sounds are fairly crucial to its resonance. I’ve definitely heard many a Sleng Teng sample crop up in reggae, hip-hop, and various UK productions over the years. Definitely an important thread in this whole conversation. Thanks!